CO2 lasers resurface the skin by causing controlled micro-injury. Results develop as the body heals itself, replacing the old, damaged skin cells with new cells, increasing collagen production and breaking up pigmentations and textural issues. CO2 laser uses carbon dioxide to vaporize tissue completely and is indicated for advanced textural issues. Dr. Cox will select a fully ablative or partially ablative (fractionated) laser setting to best suit your unique skin and expectations. 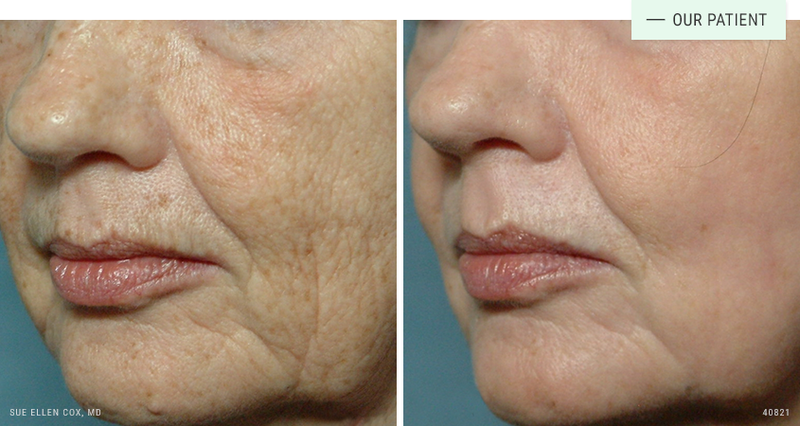 Before | After: This patient received one CO2 treatment to her full face for improvement of skin texture and tone. 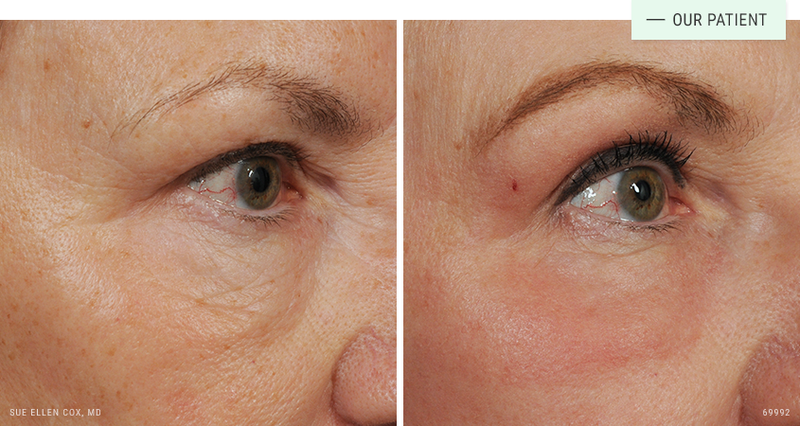 Before | After: CO2 can target smaller areas, like under the eyes. This patient is two weeks post-procedure and still a little red. The FDA has cleared CO2 laser treatment for a number of issues related to skin tone and texture. It has an excellent safety profile. As with any controlled injury to the skin, there risks associated with treatment, and with the healing process, which will be reviewed in detail during your consultation. As a teacher and trainer of other physicians in laser procedures, Dr. Cox stresses the importance of finding an experienced physician who understands the finer points of laser treatment. It is also important to know who will be providing anesthesia if that’s part of the treatment plan. CO2 laser treatment is well tolerated. Because CO2 laser is a more intensive surgical procedure, a preoperative visit is required to provide detailed information about the procedure and recovery process. Although the procedure itself typically lasts 45-60 minutes, you should plan to spend several hours in our office, and will need a driver to take you home. Comfort measures are developed for each patient based on the treatment plan and most patients report little discomfort during and after the procedure. We can also provide medication to help you relax you prior to the treatment. CO2 laser treatments requires downtime. The extent of downtime depends on the area treated and the laser settings selected to achieve your goals. Pinpoint bleeding and oozing may occur immediately after the procedure, and continue for the first 48 hours. Most patients experience swelling, puffiness, redness that typically subsides after a week, but may last up to a month. During the healing process, common side effects include itching, dryness, peeling or flaking, oozing and crusting. It is typically possible to wear make-up after 10 days, and go about your normal routine within two weeks after the procedure. The way you treat your skin during the healing process is incredibly important, and can affect your results. It is essential is follow the personalized post-care instructions given to you after your procedure. Throughout recovery, it is also important to drink lots of water and avoid all sun exposure. The CO2 laser is one of the most aggressive aesthetic laser treatments, and results tend to be dramatic. CO2 lasers are most commonly used to treat the full face or small target areas such as the area under the eyes or around the mouth. You can expect a relatively dramatic reduction of textural issues, such as crepiness, fine lines, scars, wrinkles, creases, unwanted pigment and sun damage. Improvement is generally evident within a few weeks, with further improvement noticeable over the next three to six months as the deeper layers of the skin heal, and produce elevated amounts of collagen. Patients are typically happy with results from one treatment.